ATMOS Systems, a.s. is the certified exclusive representative of the Cameron Compression Systems company (formerly COOPER Compression) for the Czech and Slovak republics. CAMERON Compression Systems is the largest manufacturer of oil-free radial turbo-compressors worldwide and was the first in the world to present the innovative radial turbo-compressor 50 years ago. Over 10,000 installations worldwide is evidence of the success of Cameron - Turbo Air® and MSG® turbocompressors. The ISO 9001 certificate and a number of other certificates are more evidence of the fact that the Cameron Compression Systems continues to strive to be the best among turbo-compressor manufacturers. During the compression process the medium being compressed is heated, which causes greater resistance to further compression as the temperature rises. The energy used to compress the heated medium (for so-called adiabatic compression) is actually utilised inexpediently and uneconomically. This deficiency can only be remedied by using an effective heat removal system and cooling the medium being compressed. This can be achieved throughout the process (for instance using oil in lubricated screw compressors) or gradually in steps in multi-level compressors, where the whole compression process is divided into several phases, between which the medium being compressed is always cooled to the set temperature. This significantly reduces the energy required. 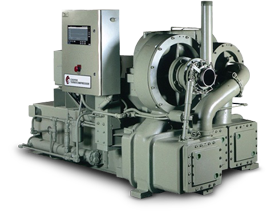 Multi-level compressors include first-class oil-free turbo-compressors manufactured by the CAMERON Compression Systems company. Cameron turbo-compressor performance ranges from 900 Nm3/h to 230,000 Nm3/h with pressures of up to 100 bar. Our satisfied customers include manufacturing companies from a broad range of industrial branches, i.e. companies requiring efficient, economic and reliable sources of compressed oil-free air. These include Škoda Auto, a.s., Air Products, PSA Peugeot Trnava, Plzeňská Energetika, Lynde Vítkovice, SIAD, Futaba and many others. Compressed air, which contains no trace of oil – Protects your system against oil contamination. Saves costly replacement of filter inserts for removing oil from air, because Cameron turbo-compressors do not produce oil-contaminated air. Maximum reliability – The axial force is captured in the massive low-revolution bearings of the transmission, which avoids stress on the high-revolution bearings on the turbine shaft. They do not contain components subject to wear. Contact-free seals. Unlimited services life of the oil bearings on the shafts. Low operating costs. The expected service life of the machine exceeds the service life of other types of turbo compressors several times. Real option of idle running – Savings in energy and exceptional service life minimise costs for producing compressed air. Application of an input paddle system assures high operating efficiency throughout the year, even when the temperature of the intake air changes. Excellent efficiency even under part load. No sliding or rubbing components in the compression process, which would be subject to wear and cause reduced efficiency. Easy maintenance – Do not contain components requiring regular replacement due to wear. Easy and quickly accessible, horizontally split transmission. Easily replaced and cleaned intercooler and aftercooler. Simple installation – Compact, fully equipped compressor unit with aftercooler, Maestro Universal control system, electrical motor and lubrication system. Minimum external connections. Compact construction with minimum demands on built-on area. Does not require special foundations. GDPR | Generall term and conditions | © 2014 Atmos Chrást - compressor manufacturer, programming and design K2N way Ltd.